Recently, I have been working on writing and rewriting (along with several of our team of experienced coaches) several more chess lessons and topics to include in the Chess4Life curriculum. While doing so, it seemed appropriate to include a couple interesting elements that may help you or your children better understand chess strategy. More specifically, I will discuss some elements regarding unique characteristics of some chess pieces. 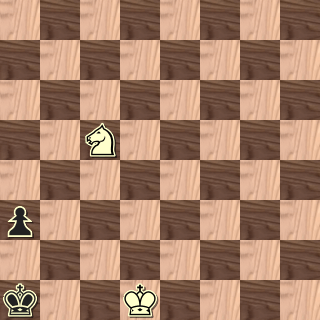 Obviously, the black pawn is VERY close to becoming a new queen, and white has nothing but his king with which to stop the advance. 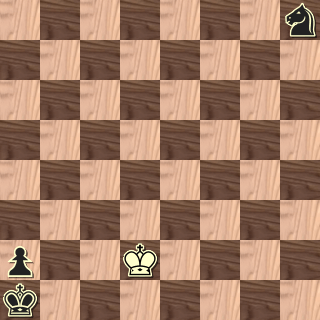 White has only two reasonable choices to try to hold on for a draw: Kc1 or Kc2, intending to block the black king in. But isn’t it hopeless with an extra black knight on the board? Actually, it is possible to hold this position to a draw. Which square is the best choice? Hint: figure out what happens if the black knight makes its way over to where the action is and attempts to drive away the white king. Try to solve the puzzle first before looking at the answer. Please share how chess has influenced your life or your child’s life. You can add your comment below. Elliott is the founder of Chess4Life and creator of the kid-friendly Chess School on DVD Series. The organization reaches thousands of kids and teaches life skills through chess.